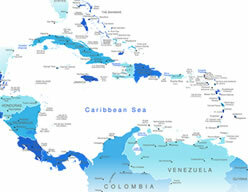 Greetings and thank you for visiting the Caribbean Desalination Association’s (CaribDA) Website. With expanding populations and limited freshwater supply and storage, many any of the island nations in the Caribbean are partially or entirely dependent upon desalination and water re-use. In common with arid regions, islands and coastal communities that employ these technologies the world over, we seek to ensure that they are employed in the most efficient and economically sound methods possible. To that aim you will find here notices of upcoming events (conferences, technical training and workshops) and published newsletters related to desalination and water re-use in the greater Caribbean and those hosted by associated organizations around the globe. You will also find information on initiatives being undertaken by our Young Leaders Program for students and younger industry professionals and by our Humanitarian Committee which undertakes initiatives in the greater Caribbean to assist our neighbors. In addition, our Members have access to additional information including up-to-date worldwide operating data, groundbreaking water research programs, water user needs, products and manufacturer services and our membership directory – an important reference of technical authorities, suppliers and peers in the industry. I invite you to explore and please feel free to contact us if you have any questions or are interested in becoming a member or attending an upcoming event. We look forward to speaking with you soon.